Planning something a little different this New Year's Eve? 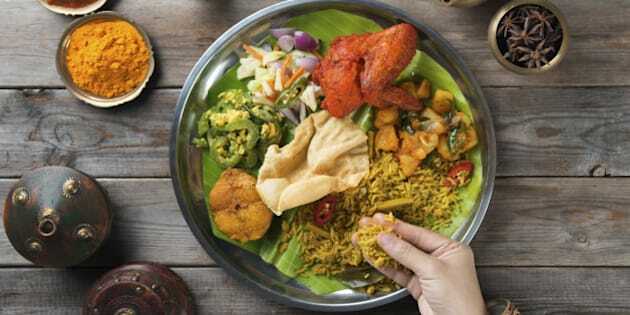 If you are a food adventurer, why not throw in some, saffron, ginger and other spices and make yourself an indulgent Indian feast as you welcome in the New Year. In India, like in some other countries around the world, food plays a major part of the New Year's Eve traditions. Planning something a little different this New Year's Eve? If you are a food adventurer, why not throw in some, saffron, ginger and other spices and make yourself an indulgent Indian feast as you welcome in the New Year. In North America, I soon realized New Year's Eve traditions meant drinking fantastic champagne, and dancing the night away, with a sprinkling of delicious canapés to keep you going till the wee hours of the morning. In India, like in some other countries around the world, food plays a major part of the New Year's Eve traditions. All our festive foods made an appearance at the meal. In Italy, traditional meals served at New Years include sausage and lentil stew, soba noodles in Japan and King Cakes in France. In India, it's the decadent foods that come out during the big holidays, the special chicken curries, the kebabs, and succulent legs of lamb, slow roasted with lots of spices. If you like the New Year's recipe below, you can further expand your kitchen's diversity by watching my new cooking show, Essence of India, which returns to Canada's Gusto TV in January. The network is also airing a full month of holiday food programming throughout December, so there are lots of ideas and recipes to mix things up. When I plan my New Year's Eve meal, I think back to the meals I used to eat back home in India -- flavourful and packed with spices and condiments. While the traditional New Year's is Diwali, usually in November and centers around the calendar of the moon, modern India has embraced the global New Year's Eve date of December 31. So we get to celebrate twice! Which means twice the meal preparation, but also, double the fun! I remember a few years ago, heading back to Delhi for New Year's Eve and eating one of the best meals of my life! The food was rich, decadent, spice laden and full of tradition. We all sit down to a meal, shared with friends and family, and days of planning goes into the meal. A New Year's Eve staple is the Raan or the succulent leg of lamb. It's deliciously decadent, and can feed up to ten people easily. There's also great folklore around the dish. 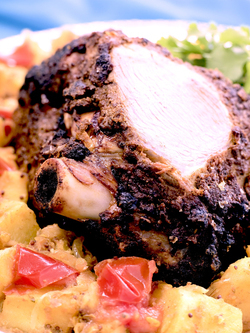 Apparently as history dictates, the name Raan also known as Sikandari Raan, means "Alexander's Lamb." As the legend goes, Alexander the Great captured the Indian King Porus in battle all the way back to 300 BC. When asked how he wanted to be treated in captivity, Porus answered, "Like a king." Alexander immediately released King Porus and agreed to be his friend. The barbecued whole leg of lamb was "Piece de Resistance" at this banquet battlefield held to celebrate the new legendary friendship of the Great Alexander (or Sikandar as he was known in India) with the Indian King Porus. That's enough history and folklore. I'm now sharing my easy recipe for this fantastic dish, one I make for special occasions like New Year's Eve. Tune into Essence of India for more in 2015. •	3 ½ lb. leg of lamb on the bone. 1. Using your knife, create about 10-12 deep slits into the meat. 2. Mix all the remaining ingredients together to make the marinade, and smear it thickly all over the lamb using a basting knife. 3. Make sure that some of the marinade soaks into the slits in the meat, to ensure that it cooks well. 4. Place on a plate and cover, then leave to marinate in the refrigerator for a couple of hours. 6. Put the lamb in a roasting tin and cover loosely with foil, ensuring that it doesn't touch the lamb. Cook for about two hours until the meat is tender, basting the lamb about halfway through with the juices from the pan and the stock. This step prevents the lamb from drying on the inside. 7. Remove the foil and cook for 8-10 minutes more. 8. Take the meat out of the oven, cover loosely with foil and leave the rest in a warm place for about 15 minutes. At this point the meat should be almost falling off the bone. 9. An optional final step is to gently place the lamb on an outdoor grill or BBQ or even grill it in the oven so the exterior is nice and brown. That gives the meat a really rich brown look. This dish is delicious when served with naan bread, rice, and sliced onion. Watch Gusto TV's 'Christmas Cooking Countdown' starting December 8, with the best holiday cooking specials from home and abroad every evening until December 25 on Gusto TV. Get all of the recipes and more at gustotv.com, including daily features starting December 1 from favourite hosts Nigel Slater, Rick Stein, Rachel Allen and more. Catch a FREE PREVIEW of Gusto on now with Bell TV/Fibe Ch. 619/1619 and Eastlink Ch. 743 to January 8, 2015. On the west coast, Gusto can also be found on TELUS Optik TV.